For a theater performance that is adventurous, different, and exciting, catch Layang, being staged tomorrow and Sunday, at new community arts initiative KongsiKL, located in Taman Goodwood, Kuala Lumpur. KongsiKL, housed within a large industrial warehouse, offers a fluid, versatile set-up that encourages audiences to move around the performance area. 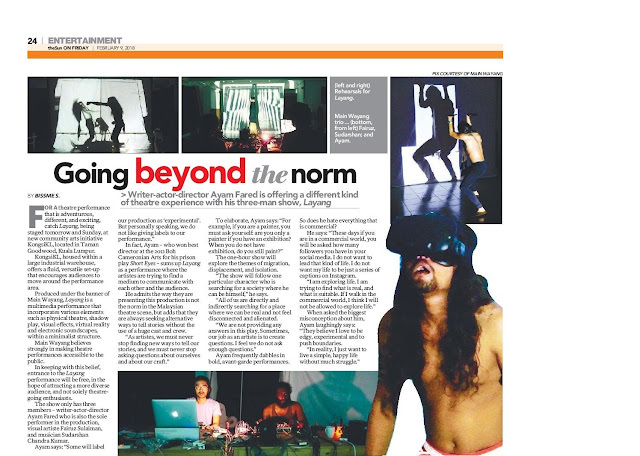 Produced under the banner of Main Wayang, Layang is a multimedia performance that incorporates various elements such as physical theatre, shadow play, visual effects, virtual reality and electronic soundscapes, within a minimalist structure. Main Wayang believes strongly in making theatre performances accessible to the public. In keeping with this belief, entrance to the Layang performance will be free, in the hope of attracting a more diverse audience, and not solely theatregoing enthusiasts. In fact, Ayam – who won best director at the 2012 Boh Cameronian Arts for his prison play Short Eyes – sums up Layang as a performance where the artistes are trying to find a medium to communicate with each other and the audience. He admits the way they are presenting this production is not the norm in the Malaysian theatre scene, but adds that they are always seeking alternative ways to tell stories without the use of a huge cast and crew. The one-hour show will explore the themes of migration, displacement, and isolation. “The show will follow one particular character who is searching for a society where he can be himself,” he says. “All of us are directly and indirectly searching for a place where we can be real and not feel disconnected and alienated. Ayam frequently dabbles in bold, avant-garde performances. So does he hate everything that is commercial?